First Alaska’s Institute is looking for a development administrative assistant who will report to Development Director. This assistant will help in assists the Development Director and key staff in fund development strategies and activities for the First Alaskans Institute. They will also ensure the mission, vision and values of the organization are incorporated into all functions of the Fund Development. The wage will be DOE; this is a 1.0 regular part-time equivalent, non-exempt. The day to day responsibilities will include assisting Development Directory in conduction research, writing and tracking grants when appropriate, maintains the database of past, current and prospective Funders, the upkeep of donor database along with filing, provides administrative support to the Development Director to support fund development activities, provides primary logistical support for Alaska Native Policy center (ANPC) events. Assists with logistical arrangements for development activities. The assistant will work with ANPC Policy & Research Coordinator to coordinate Elders and Scholarship participants’ involvement in ANPC events along with assists ANPC staff with all grant and development related activities as directed. Will need to know how to compile survey and evaluation data for reporting purposes. Assists with all fund raising efforts that support the mission and increase the Institute’s profile and also other duties as assigned. The assistant will need to have extensive experience and knowledge of Alaska Native and rural Alaska, 2-3 years of administrative, marketing or similar experience and grant writing and close-out experience desired. They will also need to understanding of and appreciation for Alaska Native cultures and history, strong writing skills, excellent verbal and written communication skills, customer-service, well spoken and works well under pressure and is able to represent First Alaskans in a cordial and professional manner. Experience working with project management, well organized when planning events. Make informed decisions, work with others and independently. Needs to know their way around word processing, spreadsheet application, database applications and other office equipment. The assistant will need to be organized, with organized goals and objective to meet deadlines. Creativity, energetic and self motivated to achieving goals. Most of all work and communicate as a team member. 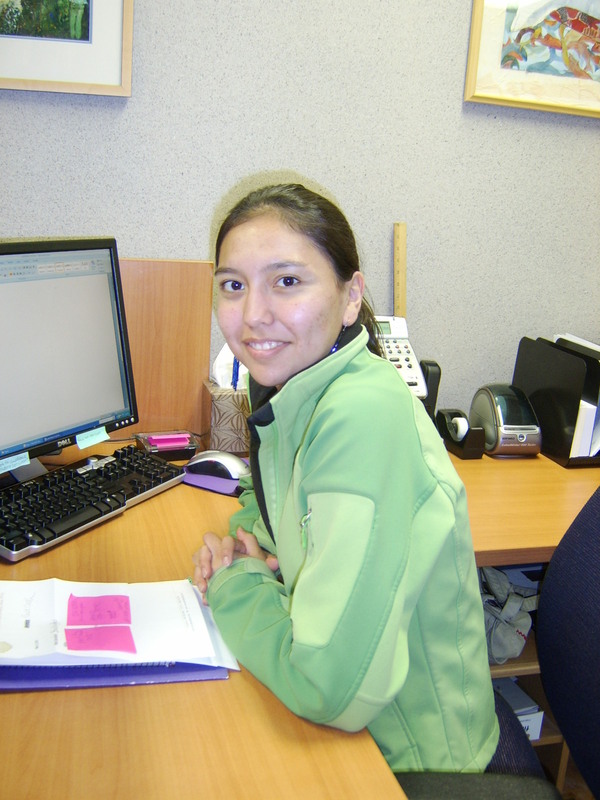 Doyon Foundation is pleased to welcome the newest member of its staff. Doyon, Limited shareholder Whitney Demientieff was hired as the Foundation’s administrative assistant in late May, and is already hard at work in the Foundation’s office. See the job description at the link below. The application deadline is Wednesday, June 9, 2010.
a. Be enrolled or accepted into an accredited or authorized college or university as a full-time student. b. Have a declared major in a 2-year, 4-year, or graduate degree program with a major in broadcast, telecommunications, business, engineering, journalism, and other media-related fields. c. Have a minimum 3.0 cumulative grade point average. d. Intend to work in Alaska in the broadcast/telecommunications industry in some capacity upon completion of the degree program and describe such intent in the Statement of Purpose. Go to www.thecirifoundation.org for application. The Yukon River Inter-Tribal Watershed Council would like to announce a recent opportunity for a paid internship with its Science and Energy Dept. in Fairbanks Alaska during the Summer of 2010. Description: The Yukon River Inter-Tribal Watershed Council (YRITWC) is a coalition of 70 Tribes and First Nations in Alaska and Canada united in protecting the Yukon River for current and future generations. The challenges the Energy Dept. seeks to address include the high cost of fuel, dependence on diesel generators for electricity, air and water pollution from burning fossil fuels, and fuel spills. The Science Dept manages the largest Indigenous operated observation network in the World. We seek to use traditional knowledge to guide our focus areas, form strong relationships within communities, train technicians, and build local capacity for Indigenous Peoples to execute their natural liberty as sovereign people. See attached internship position for more information. For more information on the Yukon River Inter-Tribal Watershed Council see our website dpelunis-messier@yritwc.org and bmaracle@yritwc.org. Take Wing Alaska, a new project of the Alaska Humanities Forum, is looking for staff for this summer’s Campus Immersion Experience. The Experience is a 12 day camp at UAA and Job Corps in Palmer where Alaska Native high school students will come to town for a cultural immersion to prepare them for the transition from their village to urban post-secondary education. Day staff will participate both in large-group activities, and small “family” group activities, along with some non-organized recreational time during the days of the camp. Night staff will monitor the camp participants in the residence halls overnight and conduct periodic room checks each night, reporting back to the Camp Director. Please see attached the job descriptions for the camp staff, and feel free to contact Amber Matthews, Project Director, at (907)272-5338 or amatthews@akhf.org with any questions. The Washington Center for Internships and Academic Seminars is an independent, nonprofit organization serving hundreds of colleges and universities in the United States and other countries by providing selected students challenging opportunities to work and learn in Washington, D.C. for academic credit. The largest program of its kind, The Washington Center has 70 full-time staff and over 40,000 alumni, many of whom are in leadership positions in the public, private and nonprofit sectors in the United States and around the world. For more information, go to http://www.twc.edu.